Keys are secured to a SmartKey which features an identification microchip and 1/8″ stainless steel locking ring for additional security and functionality. When a KeyWatcher Touch SmartKey is inserted into a key slot, identification chip data is stored and then retrieved after a key is properly accessed. Users can only access KeyWatcher Touch SmartKeys from the cabinets with a proper user code, as designated by their security managers. SmartKeys are available in several different colors (black, brown, white, grey, red, yellow, blue, and green). 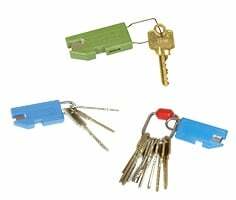 This allows for keys to be organized by color, which can be useful when utilizing several KeyWatcher Touch systems in a facility, or designating one group of SmartKeys from another within the system. SmartKeys work great when used with the tamperproof KeyRings system as well. Using KeyRings with replaceable hub technology allows for a SmartKey to securely hold larger rings of keys, or larger keys like Folger Adam keys. Learn more about Morse Watchmans tamper-proof key ring system. SmartKeys help make KeyWatcher Touch an easy-to-use key control system. The Random Key Return feature allows users to return keys to any open location in the cabinet and the system will remember the new location for that key. This avoids confusion or misplacement error – a real time saver and convenience to each user. There is also an option available for users who prefer keys to be returned to their original location.